Audi has made this as enticing as possible, almost as enticing as the upcoming RS5 Sportback. Thanks to a previous leak made by a misbehaving attendee at an Audi dealership presentation, we already knew a thing or two about the RS5 Coupe that’s just had its wraps peeled off at the 2017 Geneva Motor Show. Our eyes can already tell that it’ll be better looking, but the Audi specs sheet confirms that it will indeed make 450 horsepower and 442 lb-ft of torque, a figure available in full from 1,900 RPM and up to 5,000 RPM thanks to a twin-turbocharged 2.9-liter V6 that sends its power to all four wheels. We previously postulated that this would be a slightly revised version of the 2.9-liter twin-turbo V6 from the Porsche Panamera 4S, but Audi has made it clear that it built this unit from the ground up, helping it achieve the impressive power output numbers we see here while preserving a 27 mpg average to appease EPA regulators. This is no doubt helped by the fact that, despite being 2.9 inches longer than its predecessor, this RS5 Coupe weighs 132 pounds less than the previous version. 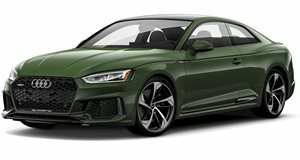 The RS5’s weight loss intentions can be signaled by an optional bare carbon fiber roof, which should go nicely with optional 20-inch wheels (up from the standard 19-inch set) and optional gloss black, carbon, or matte aluminum appearance packages. These help highlight the pronounced wheel arches, which have been widened by 0.6-inches to make for a more aggressive stance. We’re happy to announce that this pretty sedan will hit some impressive performance targets, including a 0-62 mph time of 3.9 seconds while the optional dynamic package unlocks a 174 mph top speed. These numbers are enabled by the eight-speed tiptronic transmission that can be optioned with a rear sport differential. If a carbon fiber roof wasn’t enough to lower the center of gravity, consider that Audi has already lowered the RS5 “significantly” compared to its predecessor while outfitting it with Dynamic Ride Control, ceramic brakes, and dynamic steering with RS-specific tuning. Inside, Audi has inlayed the Nappa leather seats with its signature diamond pattern stitching. Also on tap inside is a flat-bottomed steering wheel and a bevy of RS logos on the seats, steering wheel, door sill trims, and gear selector. A special RS display, which gives vital performance information like G-force, torque output, optimal shift times, and tire pressure, reminds the driver that this is still a sports car. Audi’s MMI, notable for being one of the least annoying infotainment systems, has gotten slightly better with the inclusion of a Wi-Fi hotspot to go along with Apple CarPlay and Android Auto. For now, we know that Audi will release the RS5 Coupe to European dealerships in June with a starting price of €80,900 ($85,500). If our leaked dealership presentation holds any water, which we’d wager it does given how accurate it turned out to be, we’d hold out for the Coupe’s more attractive sibling, the upcoming RS5 Sportback based on the jaw-dropping S5 Sportback we recently saw in LA.